For example, iPads max out at 64GB of internal storage. You can buy camera memory cards that size! So those hundreds of travel images will need to migrate from memory cards and mobile devices to your Mac, and integrate into your existing photo workflow. Now might be a good time to figure out how that’s going to work. We can “see” the Camera Roll from many applications, including iPhoto for iOS. But iPhoto is a bit like Hotel California. Once you edit images in the application, they stay there. They’re not automatically saved back to the Camera Roll. In order share those shots outside of iPhoto for iOS—say to your Mac—they need to be exported from the application via one of a few options. 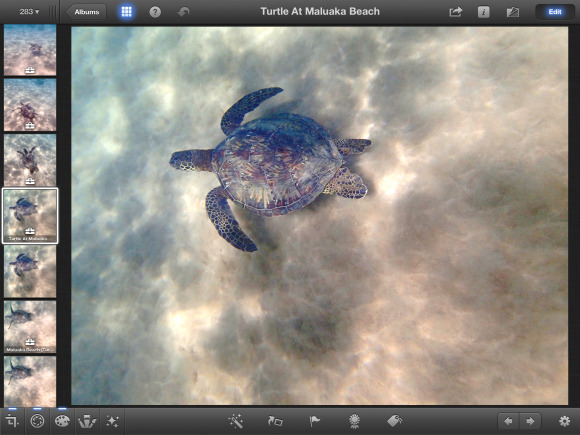 Edited images in iPhoto for iOS stay within the application until you export them. In addition to that, if you want to batch export images out of iPhoto for iOS, there are some limitations. You could save images to the Camera Roll (up to 100 as of iPhoto for iOS 1.1) and have them appear in your Photo Stream, but that can be time consuming. The iTunes approach, which I discuss below, is a fast and reliable way to move many images out of iPhoto for iOS and on to your Mac. One of the keys to using this workflow is to have enough camera memory with you to last the entire trip. Don’t erase your memory cards. When one fills up, store it in a safe place and put a fresh card in your camera. SD cards are quite affordable. If you need more than you have on hand, buy them. They’re a good investment. 1. Connect your camera or memory card to the iPad using the iPad Camera Connection Kit. 2. Browse the thumbnails on the memory card using the Photos app. It launches automatically when you connect the memory card. (You can’t directly import into iPhoto). 3. Copy the images you want to transfer by tapping once on them, indicated by a blue checkmark, then tapping the import button. Choose Import Selected from the popup menu. The pictures you selected are copied from the memory card to the iPad. Once the transfer process is finished, you’ll be asked whether to Keep or Delete the imported photos from the attached camera. Be sure to choose Keep! Remember, an important point of this workflow is to retain all of your original shots on the memory cards. Consider those cards your digital masters, like you would the film negatives in the analog days. While still in the Photos app, create your album. It will be available in iPhoto for iOS too. 1. While in the Photos tab (of the Photos app), tap the Edit button. 3. Each tap will place a blue checkmark on the thumbnail. 5. You'll have two options: Add to Existing Album or Add to New Album. Create and give your new album a name. 6. Tap the Save button. Your new Album will be displayed in the Albums tab of the Photos app. But even more importantly, it will also appear in your iPhoto for iOS library as a gray album. Now, within iPhoto, you can flag images, mark them as favorites, add tags, sort, edit, view metadata, and share them with the world. This is when the iPad is really fun. The images look fantastic on its Retina display, and you can improve them further by using iPhoto’s excellent set of editing tools. So enjoy your photos on the iPad while on the road. When you get home, upload all of your full memory cards (that you’ve carefully stored and protected) to your normal photo management application: Aperture, iPhoto, Lightroom. Every shot you took is now safe and sound on your Mac. But what about those favorite images you played with for hours on your iPad? There’s no need to re-edit those shots. You’ve already done the work. So now incorporate those finished images into the Mac’s photo library alongside the originals you’ve just uploaded. Here’s my favorite way to do that. Remember the Album of images that I had you create on the iPad? You can sort within it in iPhoto. Tap on the album to open it. While looking at the thumbnails, look for the filter control at the top of the thumbnail panel. Tap on it to reveal a pop up menu. Choose Edited Items from the list of options. One of the filters you can use in iPhoto for iOS is to display all the images you edited. All of the images in your album that you edited will now be filtered and displayed in the thumbnail panel. None of the other shots will be visible. Now go to the Share button and choose iTunes from the popup menu. Tap on All and a Share to iTunes dialog box gives you an Export button to tap, plus some information about the Sharing feature in iTunes. Tap Export, and each of your edited photos will be saved to folder and held in iTunes on your Mac. This process can take awhile on the iPad if you have a lot of edited photos. Then connect your iPad to the Mac and open iTunes. (I use the WiFi method for connecting, but the USB cable works fine too.) Click on your iPad that’s listed under Devices in the left column, then click on the Apps tab. 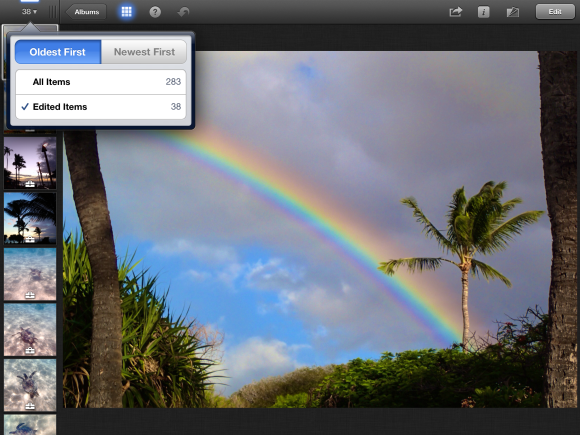 Scroll down to File Sharing and click on iPhoto. The folder with the pictures you exported will be listed there. Save them to the Desktop via drag and drop. 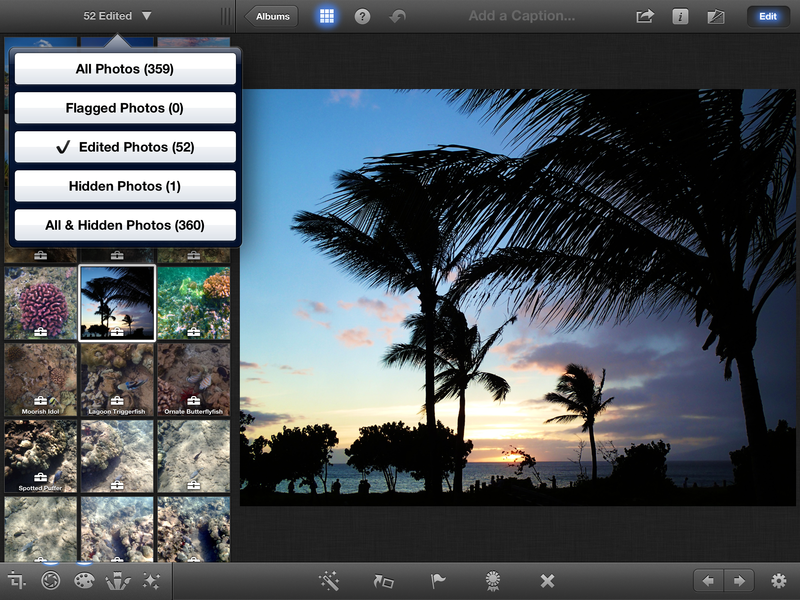 The entire folder of edited images that you exported from your iPad can be saved to your Mac. Finally, import those pictures into your photo management application along with the originals. I like to put them in a separate album, as shown here. What’s interesting to me is that I edit pictures differently on the iPad than on the Mac. Sometimes I feel that I’m more creative on the iPad. By adding those shots that I played with to my formal Aperture library gives me the best of both worlds. 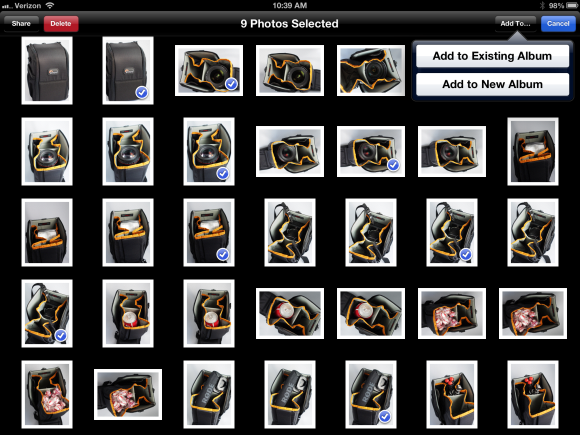 I like to create an album for my iPad-edited images that imported in to the Aperture library. 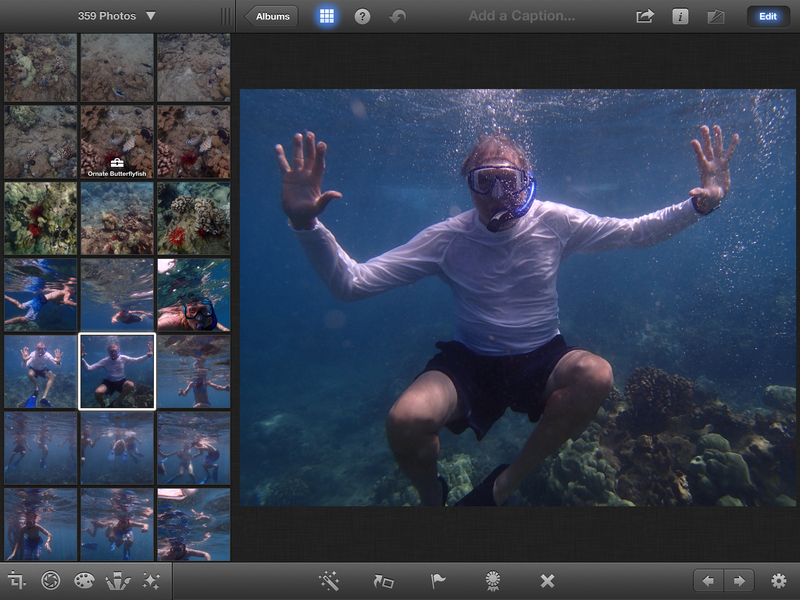 This is one way to integrate your travel images with your Mac photo library. There are other good apps for iOS, such as Photo Manager Pro, FilterStorm Pro, and Photoshop Express that have their own workflows. That said, I do like iPhoto for iOS, despite its quirks, because of its attractive interface, solid set of organizational tools, image editing power, and ease of use. And with the latest update, the maximum file size for photos is now 36.5 megapixels. So you can use this workflow with practically any DSLR. If this workflow does appeal to you, then also take a look at my Mastering Albums in iPhoto for iOS to learn more about how to organize your work within iPhoto. Chances are, even after you copy everything to your Mac, you’re still going to want to keep the really good stuff on the iPad too. After all, it’s easier to show off that way. This story was updated on 10/16 at 4:15 p.m. to clarify how imported photos are stored on the iPad, and that you can import up to 100 photos to the Camera Roll with the latest version of iPhoto for iOS.